Calling for tighter gun-control laws, Diane Edbril of CeaseFire PA and State Rep. Jewell Williams speak in the Capitol. Williams said yesterday that he'd been threatened by an Allentown man. HARRISBURG - For protection, State Rep. Jewell Williams packs a .38-caliber revolver in his North Philadelphia district and while traveling to Harrisburg. But a threatening e-mail he received yesterday has him considering a further precaution: dusting off an old bulletproof vest stored for the last seven years in his closet. The e-mail, sent by a man Williams identified as a resident of Allentown, said Williams should be shot while in the Capitol. The e-mail threat is the latest fallout from an incident Tuesday after a large gun-rights rally in the Capitol in which two men unfurled a banner on the Rotunda steps that read: "Rep. Cruz should be hung from the tree of liberty for treasonous acts against the Constitution." Rep. Angel Cruz (D., Phila.) is sponsoring legislation to require gun registration and a $10-a-gun annual fee. "Now that I hear this attitude of people recommending lynching, I'll probably be wearing my gun more and possibly wearing my bulletproof vest, because we now think we're being threatened," Williams, a former police officer, said yesterday at a news conference calling for tighter gun laws. Williams, a Democrat, was among members of the Legislative Black Caucus who on Tuesday called on the state police to investigate the banner, believing it amounted to a terroristic threat against Cruz, the General Assembly's only Latino member. The banner remained a hot topic at the Capitol yesterday, even playing a role in a committee hearing on legislation to curb illegal guns. 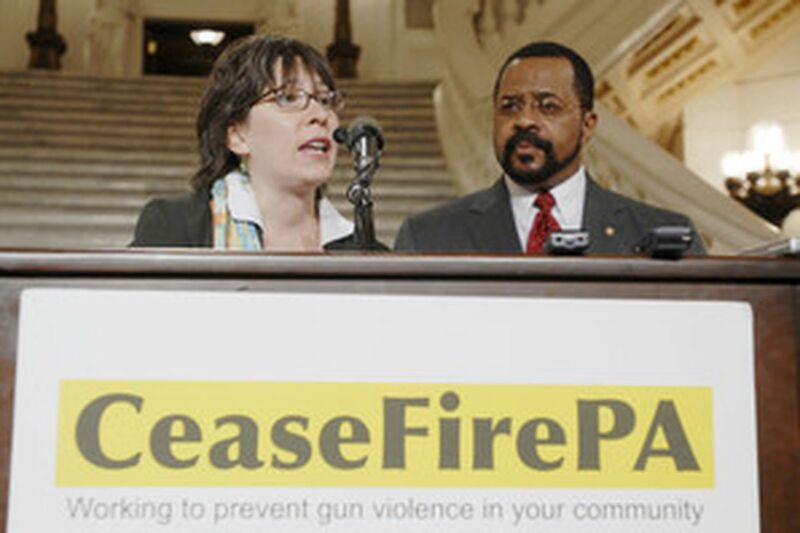 Diane Edbril, executive director of CeaseFirePA, told the House Judiciary Committee that in Pennsylvania "the pro-gun violence lobby has held sway to the point that this week one of its members felt empowered enough to suggest inside the Capitol building that a lawmaker be killed for advocating more gun regulations." John Hohenwarter, a lobbyist with the National Rifle Association, was asked about the banner at the committee hearing. He called it a "derogatory sign." "It's a shame," he told the committee. "You cannot control everybody who comes to those events." The House panel is considering four bills, including one that would limit purchases of handguns to one a month. Despite polls that show most Pennsylvanians support such limits, the legislature - made up largely of members from rural regions where hunting and the right to bear arms are king - has blocked all such efforts. "Are we going to have one abortion a month? . . . Are we going to restrict that, too?" Rep. Will Gabig (R., Cumberland) said at the hearing. "One gun a month is not going to save one life in Pennsylvania." The other bills would stiffen the legal requirements to safely secure firearms, set penalties for not reporting lost or stolen guns, and provide for minimum sentences for crimes involving the illegal transfer of weapons. On Wednesday, Gov. Rendell decried the racial overtones on the banner but said he did not support a state police investigation into the incident. Yesterday, Col. Jeffrey Miller, head of the state police, said he forwarded the Black Caucus' request for an investigation to the Capitol police, who have jurisdiction in the matter. Edward Myslewicz, a Capitol police spokesman, said the agency planned to begin an investigation. Cruz said yesterday that he had not received any death threats since the incident but planned to file a formal complaint with the Capitol police against the creators of the banner. "You have to take all threats seriously, and I don't want what happened to happen again," said Cruz. "No one's above the law." Several hundred gun-rights supporters rallied at the Capitol on Tuesday urging lawmakers to reject efforts at additional gun-control laws. In contrast, on the very same spot yesterday, four people, including Williams, spoke at a news conference calling for further gun controls. Williams said he had forwarded the e-mail to Philadelphia police and planned to notify Capitol police as well.